For 29 years, Mary Stephens had worked at the Parkersburg Care Center (now owned by Genesis Healthcare, Inc.) in Parkersburg, W.Va., the first 15 years in dietary and the last 14 years in laundry. By all accounts, she was a model employee and Local 400 member. Two years ago, a subcontracting firm, Health Care Services Group (HCSG), was hired to run the laundry. Up until this point, residents’ clothes, sheets, towels and other personal items had been washed with two workers operating the laundry. But HCSG—looking at the bottom line, rather than the actual workload—got the brilliant idea that laundry only required one worker. This person was expected to do the work of two people all by herself. Mary worked as hard as she could but kept falling behind. She had been set up to fail. In October 2018, she was terminated. Adding insult to injury, management did not follow proper discipline procedures. Instead, they just kept a diary of what Mary didn’t get finished, because the workforce had been cut by 50 percent. “I didn’t like the way they treated me,” she said. That was an understatement. After she was let go, the members at the facility united together and documented what was taking place in the laundry. They proved that the laundry job was not able to be done by one person in an eight-hour shift. Mary and her union immediately filed a grievance. 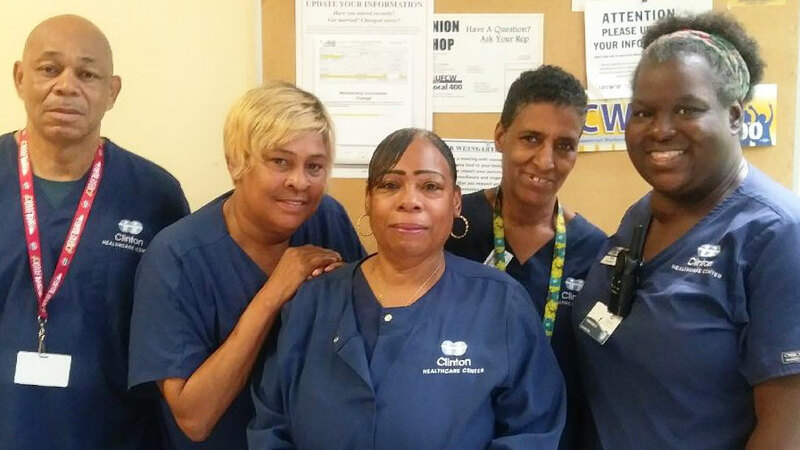 When the case was scheduled for arbitration, HCSG reached out to the Union one more time and we reached an agreement. Under the agreement, Mary received a check for over $12,000.00. “My union did what they could and they did their job,” she said. Mary has decided not to return to work and start her retirement. In the meantime, the subcontractor running the laundry operation has been bringing in extra people to help, suddenly realizing the job is too big for one person. Unfortunately, this “epiphany” was too late for Mary. But her union ensured that justice was served. Loan Cao, a 29-year member of Local 400 from Giant Food, holds up her backpay check for a photo with union representatives Bertha McKiver (left) and Neil Jacobs (right). For Loan Cao, it was seven-week ordeal, but thanks to her union, it was one with a happy ending. A 29-year Local 400 member who works in the front end at Giant Food #795 in Springfield, Va., Loan was suddenly fired on December 11, 2018. She was alleged to have done something wrong when she was closing the store one night, but another employee who did the exact same thing received no discipline whatsoever. Fair treatment is a fundamental right under your union contract. As the saying goes, “with a union contract, your boss can’t fire you without just cause. But without a union, your boss can fire you just ’cause.” Management is not allowed to discipline one worker more harshly than another employee who is disciplined for the same thing. With the help of her Local 400 representative, Bertha McKiver, Loan immediately filed a grievance, charging unfair treatment. The process was delayed by the Christmas and New Year holidays, but Local 400 persisted. Giant tried to fight the grievance, but when it became clear it would go to arbitration, the company settled. It agreed to give Loan her job back and wrote her a back pay check for $6,800. She started work again on February 2, 2019. “Oh my God, it felt like heaven,” Loan said of learning she had won her grievance. “I never expected this. What my union did for me, I’m so happy. Courtney Meadows, a Kroger shop steward in West Virginia, spoke to hundreds of attendees at the UFCW Local 401 Members’ Conference in Alberta. That’s the message Kroger shop steward Courtney Meadows brought to her sisters and brothers in Calgary, Alberta, where she was a featured speaker at UFCW Local 401’s 2019 Members’ Conference, held from March 14-17. 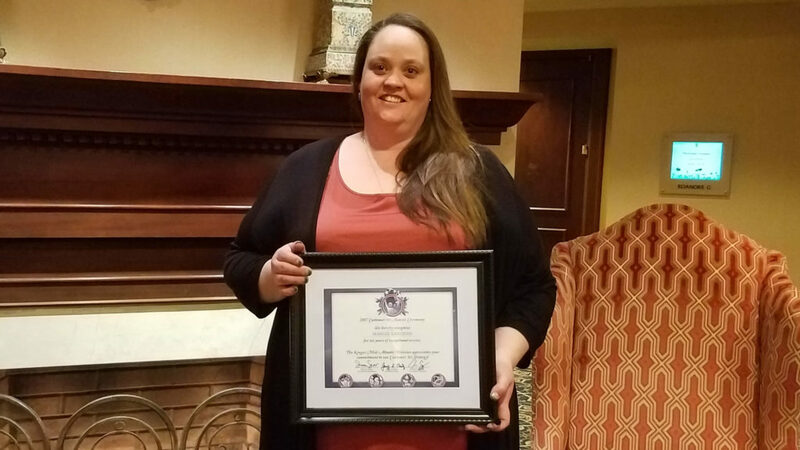 Courtney was invited after Local 401 members heard her speak at the 2018 Labor Notes Conference panel on “Contract Campaigns That Win.” They were so excited by her discussion about Local 400’s innovative tactics and member mobilization efforts around the 2017 Kroger West Virginia contract campaign, they told her they’d like to have her join them this year when they have their own bargaining with Safeway coming up. Courtney talked at length about how Local 400 members mobilized for the 2017 Kroger bargaining which resulted in the best contract for Kroger employees nationally that year, how they’ve fought back against “right to work” in West Virginia, and what it’s like to sign up Kroger members in “right to work” Virginia. “It was one of the coolest experiences I’ve ever had,” Courtney said. “They had different workshops set up for member engagement on subjects like positive action, workers’ rights, empowering women and supporting LGBTQ members. I learned about the history of labor activism in Alberta, including all the strikes they’ve had. We even went door knocking on behalf of UFCW-backed candidates in their upcoming provincial elections. With 32,000 members, UFCW Local 401 is nearly as big as Local 400, and due to the size of the province of Alberta, it covers an even larger geographic area. It is currently focused on upcoming bargaining with Safeway, though in Canada, it’s a different corporate entity than in the U.S., because in 2013, Canadian Safeway assets were was purchased by Sobeys, Inc.
Courtney, a resident of Fairdale, W.Va., who works as lead e-commerce clerk at Kroger #805 in Beckley, has been a Local 400 member for eight years. Local 400 Representative Bertha McKiver accompanied her to the conference. Margie Landers poses with her 20-year service award from Kroger. To say that Margie Landers has never had it easy is an understatement. Twenty-two years ago, she was living in a homeless shelter in Amadaville, W.Va. and she was determined to make it on her own. During the year she lived in the shelter, she took GED classes, and classes in accounting and bookkeeping. She also got a job as a cashier at Kroger #725 in St. Albans. 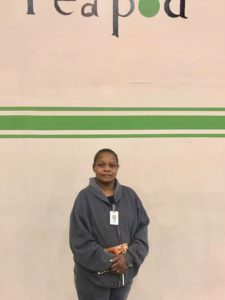 Without a car or driver’s license, Margie had to walk the nearly two miles from her shelter to Kroger every working day, but she was grateful to have a job and income. Not long after joining Kroger, Margie was able to get a place of her own. She also received her certificate in accounting and bookkeeping. And she stayed at Kroger #725, becoming full-time in 2007 and doing almost every job in the store outside of the Meat Department. “I’ve been backup dairy, head produce for a year, backup deli, you name it,” she said. Today, Margie is assistant front-end manager. However, she recently had a huge scare. One day in August, the head front-end manager was off work, so Margie was to receive an upgrade in pay for the day. It was also the day that payroll was to be transmitted, and she wanted to make sure she was paid the proper amount, but an employee cannot adjust her own pay. So Margie got another employee’s ID and password and made the entry. Unfortunately, a co-manager witnessed the event. Rather than tell Margie she wasn’t allowed to use another employee’s ID and password, he said nothing, let her do it and then reported it to the manager. She was immediately suspended. “When it happened, I filed a grievance,” Margie said. “I was freaking out. This is my first job and I’d never done anything wrong until now. It was insane. I could have lost everything—my home, my car, my dogs. When the grievance reached the second stage, Margie’s evidence—plus her moving testimony about how much her 22 years at Kroger meant to her, how far she had come, and how she would never do it again—won the day. After three weeks, she got her job back as assistant front end manager. Margie has always made a point of attending ratification meetings and staying informed about union affairs. She has also found her Local 400 sisters and brothers to be an endless source of support over her 22 years at Kroger, during which time she endured far more adversity. “I lost my son in 2003 when I was here,” Margie said. “Two years later, my mom passed away. More recently, my fiancé passed away. Kelly has been with me all 22 years and she has been my rock, along with so many other co-workers. They’ve been amazing—tremendously supportive—every step of the way. “It’s been crazy, but it’s made me who I am today,” she said. 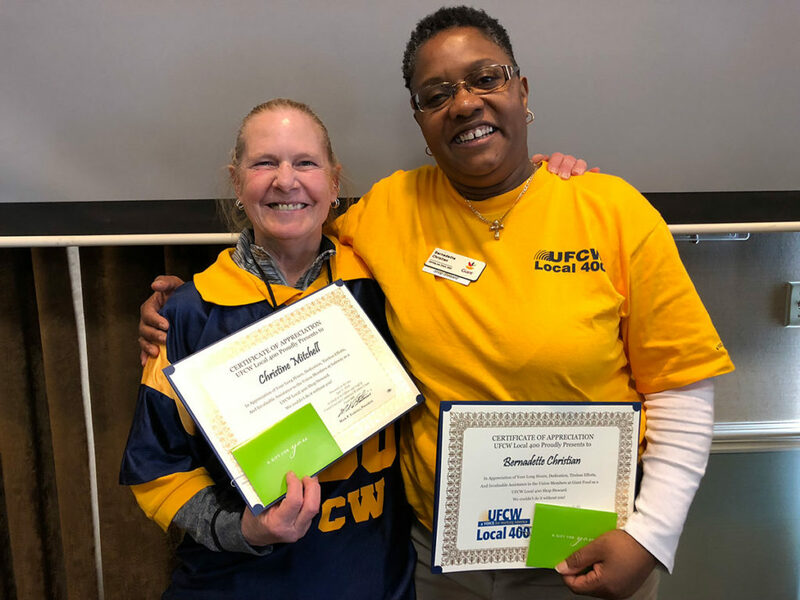 Bernadette Hopkins-Christian (right) poses for a photo with fellow shop steward Christine Mitchell after both received awards in recognition of their service. It was in the Winter of 2013. The weather was brutally cold and snow was on the ground. A young woman working in the salad bar at Giant #123 in Temple Hills, Md., had fallen on hard times and lost her home. Fortunately, her shop steward was Bernadette Hopkins-Christian. Bernadette, who works as a cashier at Giant #123, wasn’t done with her extraordinary acts of generosity. When another co-worker found himself in a similar situation, she put him up in her Clinton, Md. home for a year. Most recently, Bernadette opened her home to a third co-worker for a year and a half, before she was able to get housing and live independently. Bernadette takes the same approach in her work as shop steward at Giant #123. “They call me the Mama Bear in the building,” she said. “If someone’s hungry and doesn’t have enough food to eat, we’ll make sure someone buys them lunch. I take to heart being a steward. I care probably more than I should. With 28 years working for Giant, Bernadette calls herself and her family, “Local 400 grown.” Her sister works at Giant #123 as a pharmacy technician. Her son, who is 21 and in college, worked at Giant from the time he was 16 and worked over the summer through his freshman year. And her husband, Terrence Christian, Sr., is grocery manager at Giant #2381 in Washington, D.C. Her daughter is the only exception. Over the course of 42 years working for Kroger—40 as a shop steward—Ray Jones saw a massive amount of change. But every step of the way, through good times and bad, there was always one constant—he made sure management treated his sisters and brothers fairly. “Back in the day, everything was done at the store level,” Ray said. “Ninety-nine percent of the time, I could take care of any issue that arose in-house. If not, I could make a call, get a regional manager on the line, and take care of it on the phone. I could nip things in the bud the day they happened. “Today, it’s not like that,” he said. “Managers are too scared for their jobs to resolve problems, so they immediately get corporate involved. This leads to a long, drawn-out process and grievances that can take months. 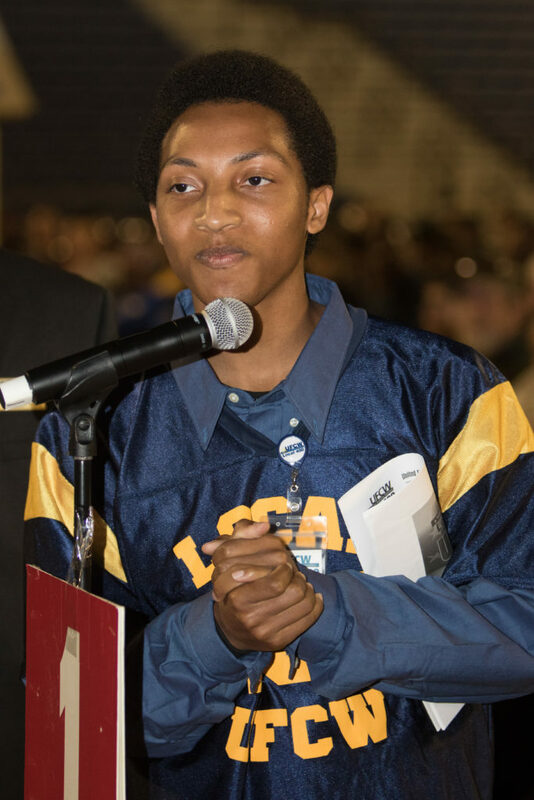 Ray’s passion for fairness and justice led him to become a shop steward when he was just 20 years old. “I had worked at Kroger in Morgantown, W.Va. for about a year and some of the employees felt there was favoritism, and they felt like I was fair, so I was asked to be an assistant steward,” he recalled. “At first, I wasn’t sure what to do, but a couple of days later, I was having lunch in an Arby’s. I asked for my roast beef sandwich without sauce and the young woman behind the counter told the manager that. But when I got my sandwich, it had sauce. So I brought it up to the counter. Then, the manager reamed the poor woman out for his own mistake, and told her to punch out and go home. She was in tears. So I gave the manager a piece of my mind and I decided right then and there that I wouldn’t let anything like that happen at Kroger. At age 60, Ray is not ready to call it a day, and he now works as a real estate broker and property appraiser. He lives in Elkins with his wife, Peggy. Together, they have four children and five grandchildren. And while he no longer works at Kroger, he deeply values his service and activism with Local 400. 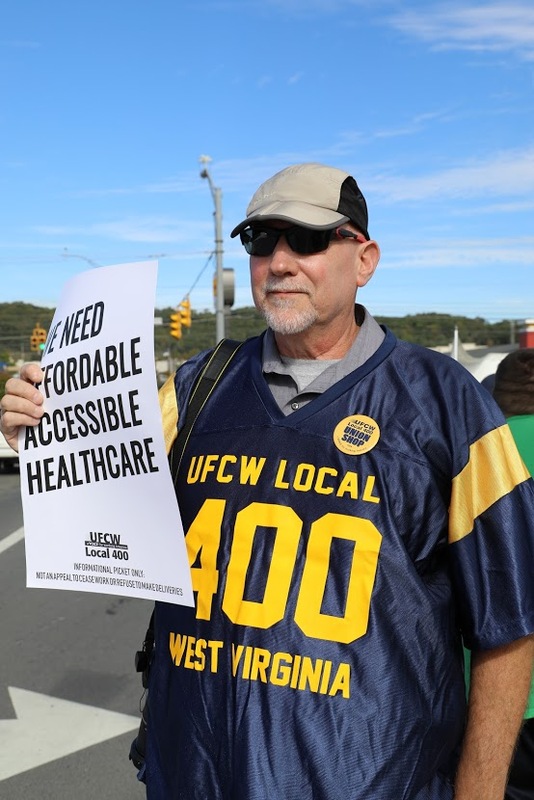 Jim Logan holds a sign at a Kroger rally in West Virginia. 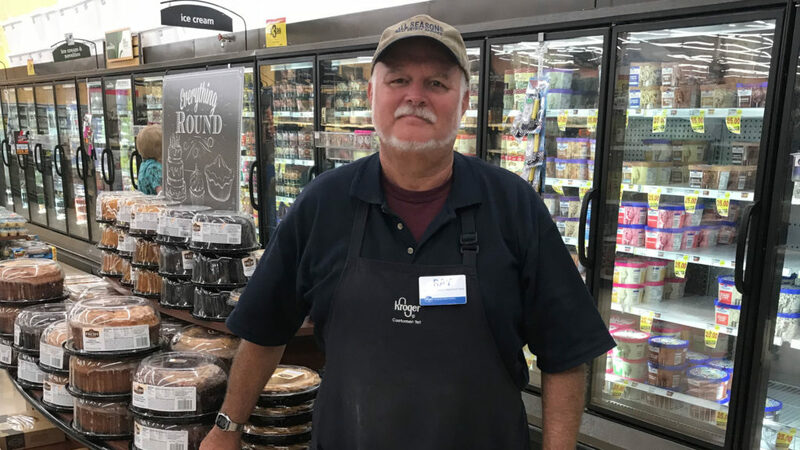 Jim Logan has been a Kroger employee and union member in West Virginia for 42 years. He lives in Caldwell and works in Fairlea, but to people who don’t live there, it’s all Lewisburg – the town with a population of around 3,800 that was named “the coolest small town in America” by Budget Travel in 2011. While Lewisburg may be celebrated for its “breathtaking vistas,” and “eclectic food scene,” the area around it is often overlooked. And he learned a lot in the process, about organizing informational picket lines, connecting with other unions and members from elsewhere, and communicating with customers about workers’ needs. When the local started organizing demonstrations at Kroger stores throughout West Virginia, Jim and his coworkers were invited to participate at the protest in Beckley, about an hour away. They certainly had cause to demonstrate – turnover was high and only getting higher and many of Jim’s coworkers, especially the younger and newer employees, felt undervalued and disrespected by the company. Now more than ever, they needed to know that their union was fighting for them and that they could and should participate in that fight. “We just really needed to say, enough is enough,” he says, and they needed to say it in Fairlea. With mounting public pressure on Kroger, an agreement was reached and a new contract was ratified a few weeks later with zero cuts. This certainly was a victory, but Jim knows there is always more work to be done. And since West Virginia became a right-to-work state in 2016, he’s learning to play a whole new ball game. As an ordained Baptist minister, Jim used to formally pastor a church, but since he’s lived in Caldwell, West Virginia he’s been “unchurching,” or holding services in people’s houses. On Tuesday nights he hosts bible study in his own home, and every once in a while, he hosts a union meeting. Otherwise, Jim and his co-workers have to drive an hour to get to union meetings, which he says can be economically burdensome. He usually only hosts union meetings at his house for special occasions, but he’s been thinking about hosting more casual get-togethers, “bridge-builders” he calls them, to help create a stronger sense of community in his store. With 42 years of experience under his belt, Jim Logan sounds patient, almost calm, but part of what allows him to connect with younger workers is that he remembers how frustrating it was to be in their position. He has a saying: “A bunch of straws are harder to break than just one.” He knows that all of his co-workers complaints are valid, no matter how long they’ve been working for Kroger, but he also knows that the best way to address them is to stand together. And it’s not changing any time soon. As he looks forward, Jim has a bunch of ideas for how he can better support his fellow union members and build community relationships, both in his corner of West Virginia and throughout the region. He hopes to retire from Kroger soon, but not from union activism.